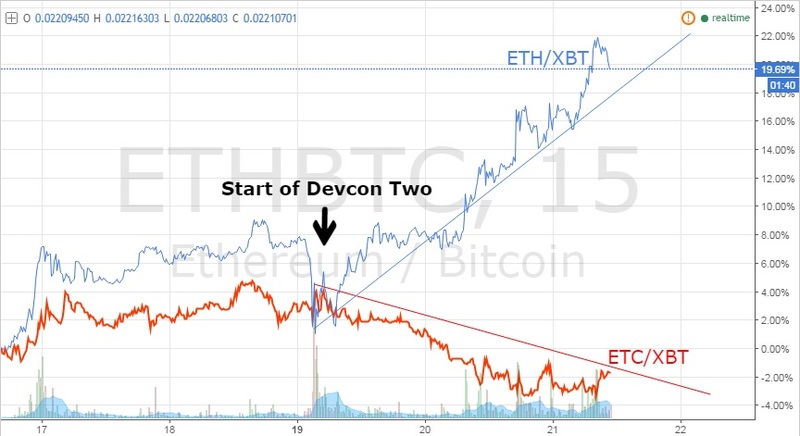 The Ethereum Foundation (EF) is stepping its game up with the number of significant news announcements coming out of Devcon Two and ETH is responding, up 21% over the past 2 days. Devcon Two is the official Ethereum conference, currently held in Shanghai where “the Foundation’s own team of developers and researchers emerge from their dev caves to present and discuss their most current work and innovations”. A Focus on Smart Contract Security: Seems the EF is learning through (epic) failure. A number of sessions have been dedicated to security on Ethereum and DAPPs, could this be a revival of faith in decentralised autonomous organisations? Zcash Integration: The ability to use Ethereum contracts to send and receive Zcash and also meaning that transactions can be conducted in private. Santander Integration: Huge news from one of the world’s largest banks, Santander will allow customers to turn bank account funds into Ethereum based tokens. It is clear from the chart above the divergence between ETH and ETC since the start of the conference. The core concept behind Ethereum Classic is to remain immutable, no forks, no bailouts, no going back. Large corporations, and clearly large banks such as Santander, are not going to invest in this train of thought. The idea of a bailout is attractive in case things go wrong and heads are about to roll. If money is pouring in from corporations to attract talent, resolute devs are going to go hungry. There will be more to come over the next few days from the conference, and I see more divergence ahead. One in particular, as I used to use the service every day, is the Ethereum Blockchain Initiatives at Thompson Reuters. The clear trade is to go long ETH and short ETC. On BitMEX we offer 33x leverage on ETHXBT and 10x onETC7D. Play the FOMO to the end of the conference and look for a close before the end of the week.